With the advent of warm weather, I have been cooking up a storm the past several weeks. I manage to make dinner about four times a week. I haven't, however, been posting my meals. However, my good lady said I needed to post a picture of this evening's effort. Apparently, I made a hit. It was elegant, though simple (according to me). 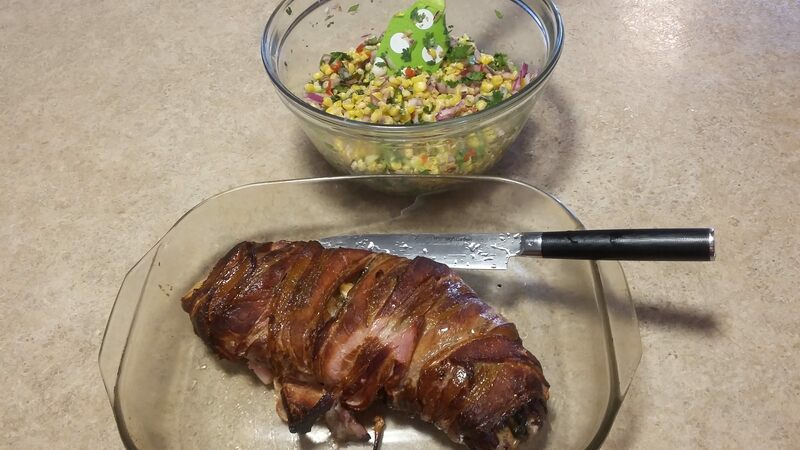 I consisted of bacon wrapped stuffed pork tenderloin and corn salsa. These ingredients were tossed and reserved as a salsa to be served with whatever I wanted. I've made variants of this dish on several occasions this summer, getting the amounts close to what we like. I prefer lime to lemon, but I didn't have any limes tonight. Before starting preparation of the meat, I started the Bradley smoker with Hickory bisquettes. My goal was a temperature of 250 F, which is about the best my old smoker will generate. I melted about 1/2 stick of butter in a large cast iron skillet, adding 1/2 of a large, sweet onion minced and four cloves of garlic minced fine. Then, I added about 1/2 of a bunch of fresh spinach, roughly chopped and eight white mushrooms sliced thin. This gamish received plenty of salt and pepper to season. When the onions and garlic were translucent, and the veggies were cooked through, I removed all from the skillet to a glass cutting board and thorough minced all. I would think that this would lend itself to being pulsed in a blender, but I didn't want to go to the trouble to get all that dirty. I stuffed the tenderloin with the veggie mix and wrapped the meat tightly with about eight strips of bacon. The Bradley was smoking perfectly when I placed the meat on a wire rack, cut side up. The meat smoked for about an hour and forty minutes. Internal temperature of the meat was 160 F with an instant-read thermometer. I removed the meat to a platter and let it set for about ten minutes. Yeah, it was that good--a delectable smokey flavour with the contrast of sweetness and zip in the salsa. Now, I'm just sitting around vegging for the remainder of the evening. Wow! That looks and sounds mighty fine! Dr Mike produces some mighty fine food! You aren’t kidding. I’m going to have to try that one. It sure makes my mouth water. Looks like I have to move again - my second-floor balcony doesn't have space for a smoker. Whoever wouldn't be ready to dive into that can't be very hungry. Looks great. Yesterday was Noah's birthday. We had ten people over for dinner last evening. I was requested to prepare ribs. 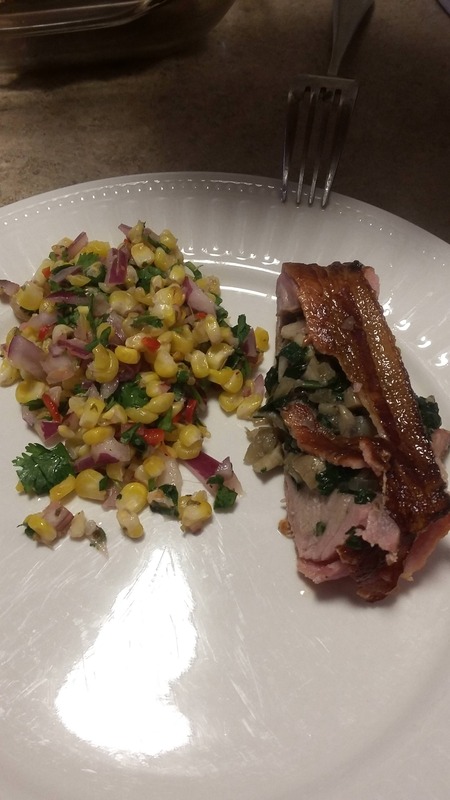 It is always a challenge as at least half of the meal must be prepared as keto-friendly, which excludes sugar for the rub and/or fruit juice as a finish for the ribs. However, the ribs I prepared were a hit. It required at least six hours of smoking in the Bradley and in the Traeger. The Bradley was caring for the ribs prepared with a brown sugar base rub and the Traeger was occupied with the keto-friendly rubbed ribs. I was so busy and I failed to get any pictures. However, I can report that all the ribs were a hit, with the keto-friendly being consumed by everyone and the sugar based ribs totally gone. Keto-friendly rub consisted of equal portions of kosher salt and smoked paprika, seasoned with chipotle pepper, cumin, coriander, oregano and dry mustard. The rub was massaged into the meat, wrapped with plastic wrap and refrigerated for four hours before putting on the grill. The sugar based rub had about 1/4 cup brown sugar, generous amounts of kosher salt and smoked paprika and seasoned with sage, rosemary, cumin, oregano and ancho pepper. The keto-friendly ribs were wrapped in foil with a quarter cup of diet Dr Pepper after they had reached an internal temperature of ~195 F and left until they reached 205 F. The meat was falling off the bone and exceptionally tender. The sugar-based ribs also received a foil wrap with a quarter cup of diet Dr. Pepper (it is what was out at that time) and a generous slather of corn syrup to finish the ribs. These all received about another hour to reach the internal temperature I sought. All were then finished on the Traeger at high temperature (~400 F) to give a good bark to the meat. Together with green bean amandine, several salads and other assorted dishes that showed up made for a hit with all who showed up. I do need to begin to remember to get more pictures. While up Moose hunting a few years back with DrMike I was able to enjoy some of his excellent meals and in fact one day he explained to me how to use is Traeger and I was able to do up some steaks with his help and they were a success. I went home and purchased a new Traeger and attempted on about 6 occasions to replicate some of his dishes while the experiment ended when I attempted to do up 1 of the salmon I brought back from Gerry's . My kids came over for supper and it was so bad that my youngest loaded up the Traeger in his truck and took it home !! Now he comes by and picks up the meat and uses the Traeger and then brings the meat back for supper . DrMike I at least tried . Maybe you need to pick up a Bradley, Dan. However, I love my Traeger so much that I bought a new one this spring and gave the old one to my SIL. Traeger is the best investment I have ever made in cooking! I have cooked our meals on the Traeger about four nights out of every week for the past ten weeks or so. I've really gone wild with cooking on this smoker-grill. I have experimented with a variety of meals. You can be assured that Thanksgiving and Christmas will continue to see me cooking. I have a thermal blanket that allows me to cook even when the snow flies and temperatures dip to -20 or lower. We put a cover over our back patio some years back, and that gives me enough shelter to spend time outside. I need to get out this week and tag my moose so I can prepare the heart and tongue. Just have a hankering for these childhood meals that linger in the corners of my mind. DrMike I did up one of those Beer Can Chicken recipes and after it was done we threw away the chicken and the can was really hard to chew !! I guess if can provide the game then someone else can prepare it . Ah ha, I see the problem now! Left-handers have real difficulties cooking on the Traeger, Dan. Oh thank you DrMike I knew there had to be a reason !! So, here I sit drooling on the keyboard, while viewing the Dr's offering!!!!! !